One of the more straight forward ways of getting involved in the magic of the film industry involves getting up incredibly early, donning silly clothing and standing in a field in the cold all day doing practically nothing. Film extras (or background) are a fundamental component of most feature film productions, it’s essential to have movement going on in the background of shot to give some depth to proceedings (let’s not get into an argument about 3D). So fundamental that the role of 3rd Assistant Director is usually tethered to herding background artists around – keeping them warm and feed, and making sure they don’t do anything too silly when anywhere near the expensive cameras. There’s no big secret about how to become an extra. It’s not a big “who you know” secret society to get into like the rest of the industry is. What is important is to sign up with one of the big established extra agencies – and to avoid any others at all costs. The one I would personally recommend are Casting Collective. We’ve been on both sides of the fence with them, me from having a rip roaring few weeks as an agent of HYDRA for the recent Captain America film – and because we have used them to cast for video productions we have produced in the past. The big agencies produce books of talent yearly and open their doors for the latest intake usually for only one day a year. It’s obviously important to find out when the agencies are preparing to do this to get involved! An important urban legend to dispel is the impression you get from Ricky Gravis’ series Extras. In the first season of Extras Ricky’s character quite happily socialises with the A List stars (even taking the piss out of them). Now it shouldn’t be a surprise to many people to realise that this doesn’t happen AT ALL. The dribbling masses are kept as far away from the stars of the feature as possible. A recent face-palming example of when the wheels fall off was during the production of 47 Ronin, starring Keanu Reeves. An extra somehow managed to evade all the usual fail safes and get INTO Keanu’s trailer and ask Keanu to record a video message for a friend’s birthday. Keanu duly obliged and the extra left. Only to be sacked, along with the 3rd Assistant Director – who now faces black balling in the industry by her peers for incompetence! Nice! 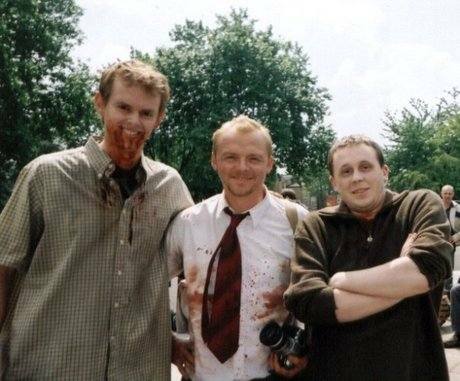 The reality for most of the time is much more prosaic, but a lot of fun can be had – in the next post I’ll write about meeting Simon Pegg and Nick Frost on Shawn of the Dead – and being in the middle of a massive laser/explosion battle with tanks and Chris Evans (not that one) in Captain America.